“You’re Killing Me Smalls!” A film that still captures the hearts of baseball fans young and old, THE SANDLOT debuted on Blu-ray/DVD combo pack March 26 from Twentieth Century Fox Home Entertainment in celebration of the beloved film’s 20th anniversary. “A charming and whimsical comedy about boys and baseball and a GREAT BIGDOG” (“Siskel & Ebert”), THE SANDLOT ranked in the Top 40 as one of the best sports movies ever. 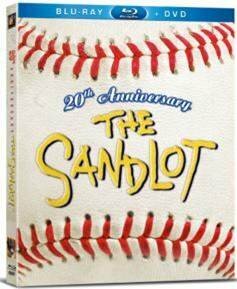 With memorable performances from nine terrific young actors and supporting appearances from Honorary Academy Award® winner James Earl Jones (Field of Dreams, Star Wars Franchise), Denis Leary (“Rescue Me”, The Ref) and Karen Allen (Raiders of the Lost Ark, Starman), THE SANDLOT 20th Anniversary Blu-ray and DVD Combo Pack includes limited edition packaging and 10 collectible cast baseball cards. It’s early 1960s and fifth-grader Scotty Smalls has just moved into town with his folks. Kids call him a dork - he can't even throw a baseball! But that changes when the leader of the neighborhood gang recruits him to play on the nearby sandlot field. It's the beginning of a magical summer of baseball, wild adventures, first kisses, and fun! In connection with the release, FHE will embark on a partnership with Benny the Jet’s favorite shoe brand PF Flyers, for a special one-of-a-kind promotion. Beginning March 26, a limited run of “The Secret Weapon,” will be made available inside a vintage 1960’s shoe box, along with a $3 SANDLOT coupon inside. Additionally, all Blu-ray and DVD combo packs will feature a 10% PF Flyer discount coupon inside the packaging. Further information on this exclusive purchase can be found at www.pfflyers.com. Additionally, The “Sandlot Baseball Field Program” will be comprised of partnerships with Major League Baseball teams nationwide in connection with the FOX Sports Networks. Notable teams such as the St. Louis Cardinals, Texas Rangers and Minnesota Twins will coordinate baseball field renovations across the Unites States so that loyal fans and baseball lovers everywhere will get the chance to enjoy their own “Sandlot” field in their backyards. Furthermore, screenings of THE SANDLOT will be hosted at several Major and Minor League ballparks across the country with Director, Writer and Narrator, David Mickey Evans. So lace up your mitt and get ready for a season full of baseball fun!